Eggplants are the perfect addition to any kitchen garden as they come in many shapes and sizes, offering the cook and gardener a varied set of tastes and textures. Add this plant to your kitchen garden for extra flavor and color! Classic eggplants: The traditional pear-shaped, glossy purple eggplant is the most commonly seen in grocery stores, but there are a number of other wonderful pear-shaped varieties that come in lighter colors or even stripes. For Example, try 'Black Beauty', an Asian heirloom with rich rose-purple color and delicious flavor. Oriental eggplants: Shaped more like zucchini than they are eggplants, Oriental varieties develop long, cylindrical fruits that are easy to slice with a rich wonderful flavor. 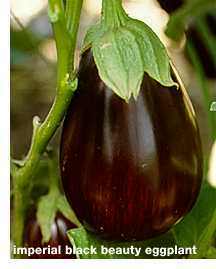 Oriental eggplant varieties are also more productive than classic eggplants. 'Ichiban' is a good choice. Other eggplants: If you want to grow something really different you should include some of the white or orange eggplants. Even if you don't like to eat eggplant these beauties make wonderful ornamentals for your flower border. The 'Green Goddess' is a unique variety.